Staying on top of the laundry has been a many year long goal for me and depending on the season of life I am in, I may be doing better or worse at it. Take for instance a few days after Addie was born. Our dryer chose that wonderful season to give up the ghost. It was our family's third dryer in four years. Can you imagine how many more we would burn through if I did not hang laundry outside half of the year? Sean blessed me so much with a new front load set to mark the passing of the third dryer. I can fit so much more laundry into the washer, it comes out less wet, and the dryer dries it quicker so less energy is being used, which saves us money. I've also noticed the laundry is coming out CLEANER! A washer and dryer may not sound like a romantic gift but they spoke volumes of loving serenades to my soul because eight people and cloth diapering makes for a lot of laundry. Our washer and dryer are in a nook at the top of our stairs, open for eyes to see. Our old washer and dryer were behind bi fold doors in the same spot, but the new washer and dryer are slightly bigger so we took the doors off. That has been great motivation for me to keep them tidy. My routine now is this. At night before bed, I start a load of laundry. This is everyone's clothing from the day, a pile of kitchen towels and washcloths, and cloth diapers. It all goes in together and it all gets washed hot. If there is a big variety in the colors, like a pile of blue jeans and white t-shirts, I'll throw in a color catcher sheet. If it isn't too late when that load is done, I'll sort a dryer pile and a rack pile. Some of my flannel cloth diapers I hang on the rack to dry in front of the wood stove because they are so thick and this dries them overnight quickly. 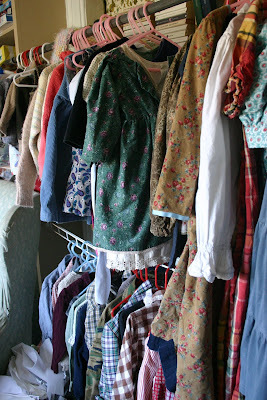 Heavy items like jeans and sweatshirts get hung in front of the wood stove also. Small items like sock and underwear go into the dryer. I also put my flannel nursing pads into the dryer too because I like the high heat to kill anything that may have survived the washing machine. If I am in bed when this load is done, I sort it the same in the morning. In the morning I wait for everyone to get dressed, chores to be done and start another load of laundry. Usually this is more diapers, washcloths, pajamas, sheet sets if needed, and any clothing that was soiled during chores or breakfast. Two loads a day usually does it. If I'm good, I sort it as it comes out of the dryer. I sort the oldest four kids laundry and they fold it and put it away. I'll usually assign Ella to towels and Chase loves to carry his papa's laundry and put it on the bed. Mismatched socks go into a laundry basket (which is currently half full...grr....). Speaking of socks, if you have a genius idea for avoiding the abyss of mismatched ones, please, please share. My current train of thought is to go spend $25 and buy everyone their own unique pack of socks so we easily know who's is whose. In the past I've just bought whatever packages of socks that have been on sale and it is a big confused mess, especially with boys that wear the same size socks. Sean and I share a teeny, oh so tiny closet in our room. Really teeny, like less than two feet wide. We each have a dresser also. I was hanging all of our children's clothing in the same place, but recently took out the girl's dresses and moved them to their own closet because space was getting too tight on the one bar. Each child has their own color hanger. I love this and it works great. Their clothing is kept on shelves, where I can quickly and easily check it for neatness. Socks, pajamas, and underwear each have their own plastic bin, which I purchased at our dollar store. This method works a thousand times better for me than dressers ever did and takes up less space. Altogether the shelves housing the clothes for six kids takes up about five feet in width, floor to ceiling. I also have fabric and some books stored on the same shelving so there is room to spare. One final laundry tip is to go through your clothing and your children's clothing with a critical eye. I noticed that whenever we went out into public, I'd have to have the boys change their stained shirts and so I tossed a pile of them or repurposed them and kept maybe one or two dingy ones for outside play. Any items that would take serious time to repair, were faded or ill fitting I donated. Wool socks I have darned in the past because they are worth the extra life. My current mode of thought is to pare down how many outfits of clothing we each have. Less clothes = less laundry. Finally, we make our own laundry detergent. It is so inexpensive, smells great and I know exactly what I am putting on my children's skin and into our ground water. I use the Duggar's recipe, which you can find on this page, but I use an all natural bar soap instead of the Fels Naptha, which is very smelly and strong. Any castille bar soap makes a great substitute. I also add in essential oils for a great smell. Toss me your ideas now. What works for your family. Do you have a separate laundry room? A marvelous sock idea? Edited to add: I completely forgot to mention that Annaliese does her own laundry, and whatever laundry Ella has left lying around their bedroom. Her laundry day is Tuesday and she can do it all on her own. For boys socks that all match, my mom of seven kids would put a permanent mark on the bottom of each sock as it came out of the pack. Each child had their specific mark (1 dot, a slash and a dot, etc) so she could seperate the baskets of socks quickly and easily. I did see a great idea on someone elses blog: every family member gets one of those zip-up mesh sacks designed for delicates that can be thrown in the washer. Socks are taken off and put straight in the bag. Every so often the bags are collected, zipped up, and tossed in the washer and dryer, then returned to their owners. The sock pairs stay together since they're in zipped bags. Of course, it all depends on the sock owners putting them into the bag as a pair in the first place. The success may vary between ages :-). I've got two ideas from others on the whole sock idea. One family I know uses a sharpie or laundry marker and puts a small code or initials on the bottom of the socks near the toes. Another family uses a small mesh bag for each child with their socks and underwear in them. Many years ago I decided to start with a clean slate concerning our socks. I threw them all away! Now this took courage because we had eight in socks and our budget was small for clothing. I then went out and bought the boys one package of black socks and one package of white. All the socks were the same brand. I bought my daughter one set of white and some colored tights. When I did the laundry they all would grab the darks and then the whites. They would each take 5 pair of black and a few of the white or vise versa depending on what the season was. This may not work for everyone but it has worked for our family. One note, when the children get old enough to do their own laundry they get to have their own style of sock because I don't have to keep track of them anymore!! My daughter now has her own and one son likes gray tube socks and wool socks. I have a question. Do you use your homemade laundry detergent for washing your cloth diapers? If so, what bar of soap do you use for mixing your detergent? I make homemade soap using the cold process method and wanted to know if you reccomend using that or not? First I am going to re-introduce myself, b/c I've changed my blog and am under a new name. I used to be Enjoy the Journey. Anyways, lets see. My grandparents used to take socks and mark them with dots on the toes. They had four kids. Child #1, had 1 dot. #2, 2 dots and so on. This helped b/c when they grew out of them and the next child was able to use them, they just added a dot. Everyone knew their dot number and knew which clothing was theirs. This worked for more then just socks. Now, I have 3 boys. My two older ones have one sock drawer and they can share. My youngest is only 1, so we can tell the difference. I'm pretty sure that in the future I will be adding the dot method with more kiddos! Hannah - I've read your blog for years now and am always thankful for what you write. I enjoy the peace that comes out even in your writing. I know that you aren't perfect, no one is. So - no idolization. I just enjoy your writings. Our laundry is in the hall bath, and with 4 kids, gets pretty overloaded. I had thought about doing away with dressers, may give it some more thought. If I do not do a load or two a day, I get really behind. I tried their recipe with Zote soap, it works but then our water changed in town and it didn't work as well. I forgot - for the sock problem - at one point all the kids had similar socks - go to the dollar store and get the lingerie bags and mark them, wash and dry them in those - it was the cheapest solution for that time. With the socks, I read that the people of the 'Parents of a Dozen' blog put elastic bands around each pair of socks, this gets them through the wash in pairs and then voila easy to sort afterwards. Don't know how the elastic will go in the dryer though. I also uses the small laundry bag. It works pretty well. Also, I have only 3 children (2 girls - 8 and 3- and a boy - 2). While I don't have some clever sock solution, I have managed to eliminate about half of my problem by simply having the girls wear tights in the winter and flip flops in the summer. I appreciated seeing how you do your system and I found it intriguing that you do it every day. Do you find that you feel like you are never done with the laundry because you don't have a day or so with a break in between? Otherwise, I'll bet that you have significant stain reduction because they never have a chance to set in. We have six littles (oldest is nearly 8 and youngest two are 15 months)...I like the dot method. Question for you - what castille bar soap do you use? SOCKS!!! The method that works for our family of seven: Everyone only has ONE type of socks (with each person having one pair of "black dress socks") and I buy the Hanes ones. They have "Hanes" written on the bottom in different colors and are color coded by the company, each size a different color. Then I just toss the right color in the right kids basket - I don't match them because they are all the same. In the morning they just grab two socks and they are off! It has worked SOOOO much better for us than sorting, pairing and folding! Thank you all for the suggestions. I think I'm going to go with the same white socks for our two boys with a few black dress socks and toss/donate all the other matches we have. The girls mostly wear tights in the winter and I'll take a look in the stores to see what color options I have for them. Amanda, I wash everything together so yes, the same detergent for everything. I haven't had any issue with my diapers with it. They still work great but because of our hard water I've read I should "strip" them every so often. I think this is done with a hot water/ vinegar combo. Quinn, I don;t mind doing laundry every day. i guess I am just used to it and glad it isn't four loads any more as it was with the smaller washing machine. If I skipped a day the upstairs hall would be buried in stinky laundry because there is no where for it to go. Right now, dirty clothes go right into the washing machine and when it is full I run it. No hamper room. Christa, I use the castille bar soap from Wegmans which is a grocery chain with a huge natural/organic section. I used to use liquid castille soap like Brommers but the bar soap is so much cheaper. Once we have a go at making our own soap I'll try that too and see how it works. I really like the plastic bins for the children's clothing. I am going to stop at the dollar store and look for these. We make our own detergent too. I usually use Ivory soap, which has worked well for us. Socks, I have given up. We have four males in our home that wear the same size. Of course we have different styles etc. that we have bought so I just put them all in a large hamper. We really need a better system. We like the Hanes socks. Each size has a different color strip under the ball of the foot. Girls medium may be red while boy medium are green, etc. 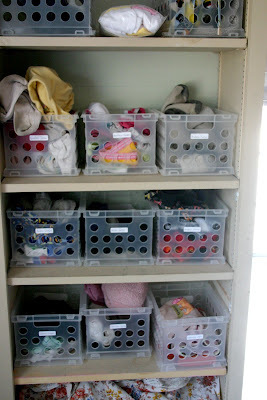 It's already on there and my kids can sort their own socks, even the 1 year old! Thanks Hannah. I've been thinking about it all day, and I really might give it a try. As it is now, I have piles of dirties everywhere! There's our laundry in our room (2 hampers- one for adults & one for the baby), a corner of the kids closet, dirty towels in both bathrooms, and then I have a failing system of sorting buckets on the basement stairs and sorting baskets on the basement floor where my w & d is. They're supposed to sort them to the buckets and then when they're full take them down to the baskets, but clearly it isn't working. I guess it never occurred to me to do it every day so there aren't piles everywhere! Thanks! I love your closet idea. That just might work a whole lot better than individual dressers. Do you have older ones who want their own personal space rather than shared space? We have been trying to pare down our clothes too - we had several good years of receiving hand-me-downs but now realize we have too much stuff to manage. Two sock ideas - when I was growing up my mom had these little plastic things that kept each pair together. They came in different colors - each person could have a different one. What my husband and I do is each pick a few varieties of sock that work well for us, and then buy a bunch of that, all at once. The initial expense is greater, but it's so easy to match them. Also, as they wear out you get more use as you continue to use the remaining ones, compared to single pairs of socks where if one is done, both are. These purchases last us for years, and my minimalist husband loves having just two choices, white and black. 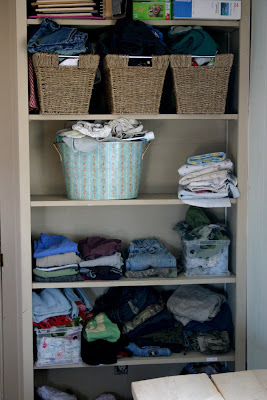 I love reading your blog... it's funny how happy this post about laundry makes me. I am in the midst of converting to cloth diapers & figuring out laundry. It seems impossible to keep up and I just have 1 baby! It's nice to know that it's not the end of the world if I wash cloth diapers with other things. I am also planning to try the Duggar's recipe, I am considering doing it with ivory soap. What type of cloth diapers do you use and do you pre-wash them? Any other random pearls of wisdom about cloth diapers? Laundry....ack! We have 5 kids and one foster son and laundry is an every present struggle. Ours is done in the basement and is stored there as well in cubical type storage similar to your baskets. That works well..the socks not so much. Just a few days ago my husband mentioned wanting to get rid of them all and start over with the "same" kind. My mother in law bought our boys socks with stripes on the toe...more stripes is a bigger sock. They are so easy to match. My husband and I pin our socks with brass safety pins (and the kids too if we can catch them in pairs). Do you use some sort of laundry boost? We have VERY hard water, and I can't use warm or hot water as it sometimes leaves rust stains on the clothes. The result is grey, dingy whites and lights. Advice? Looking forward to trying homemade laundry soap - thanks for the tips! To save money and to help reduce our carbon footprint. I no longer use a drier. The best surprise was that it really did not increase the time I spent doing laundry. I start a load of laundry the same time that I start supper. By the time the kitchen is cleaned up the washer is done. I then set my clothes drying rack up in the middle of my kitchen and hang my clothes up on it. All my shirts get dried right on the hanger. So when I get up in the morning clothes are dry and I simply move them to where they need to go. If I need to do a second load then that drying rack goes in the middle of the living room. Since every one is in bed it is not in the way there. I have found this is really easy. It reduces ironing and the forgotten load in the drier. Please I really believe that we need to start making these changes to reduce our need for coal and other carbon fuels.